Artist’s impression of the Avenue Street Mall at Star Avenue at Damansara. Mah Sing Group Berhad registered sales of RM242.5million during the launch of Phase1&2 of Star Avenue@D’sara in Sungai Buloh over the weekend. 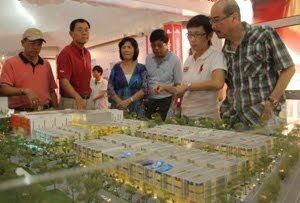 The launch attracted more than 800 prospective buyers and all 92 units of the three storey shop offices averagely priced from RM2.6million were snapped up. “We have been quite confident that Star Avenue@D’sara shops would be well received based on its strong potential and exceptional value but a 100% take up rate on the first sales launch event weekend has exceeded our expectations and was a pleasant surprise. We are happy that the purchasers appreciated our effort in designing the shops to encourage business vibrancy with features such as wide frontage, corridors and walkways, besides boasting high floor to ceiling height of 22 feet which gives an option to owners to possibly add a mezzanine floor. Its appeal is further enhanced by virtue of it being the first and only night guarded shop office development. In view of the overwhelming response to Star Avenue@D’sara over the weekend, we are now opening 46 units of the Avenue Street Mall retail lots for registration,” said Mah Sing’s chief operating officer Andy Chua. The Avenue Street Mall offers 370,000sq ft of nett lettable area spread over four levels, and Mah Sing Group intends to keep approximately 60% to ensure the right tenancy mix to maximize the rental yields and increase capital appreciation. The proposed tenancy mix include F&B outlets, a supermarket, IT and tele-communications center, bowling alley, fashion and accessories stores, etc. With an estimated catchment of 360,000 people within a 15 minutes drive and excellent visibility with more than 300,000 passing traffic daily, and the lack of a competing mall nearby, Star Avenue@D’sara is poised to be a shopping hotspot. Ample carpark with more than 1,500 bays on the ground floor and basement level has been allocated to cater to the expected influx of shoppers. The project is only 3 minutes from the proposed MRT Station in Taman Industri Sg. Buluh and strategically located at the busy traffic junction of Jalan Sungai Buloh (Guthrie Corridor), Persiaran Cakerawala and Jalan Lapangan Terbang Subang. Buyer taking a closer look at Star Avenue at Damansara. With Phase 1&2 shop offices fully taken up, registration is now open for 46 units of the Avenue Street Mall retail lots. “As connectivity is becoming more and more of a factor that appeals to the market, Star Avenue@D’sara's strategic location as well its superb accessibility and large population catchment that includes Subang, Subang Bestari, Sungai Buloh, Ara Damansara, Kota Damansara, Mutiara Damansara would serve the business community well. Star Avenue@D’sara shall be able to tap on the 13,000 students at the proposed new Help University Collegue-Subang 2 Campus, via Persiaran Cakerawala which is currently being upgraded into a 6 lane road. This project is also adjacent to the much talk about 3,300-acre Rubber Research Institute of Malaysia (RRIM) privatization land to be developed by EPF. Buyers are obviously optimistic of the RRIM land potential,” said Andy Chua. More information on Star Avenue@D’sara is available on www.mahsing.com.my or 03-92218 888. KUALA LUMPUR: Property developer I&P Group Sdn Bhd will launch several projects in its existing townships in Klang Valley and Johor Baru this year with an estimated gross development value (GDV) of over RM2 billion. The projects, which will be launched between May and December, are located in Kuala Lumpur, Shah Alam, Bangi, Cheras, Puchong, Klang and Johor. 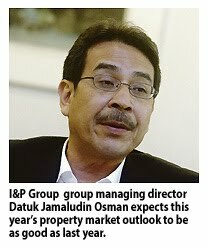 Group managing director Datuk Jamaludin Osman expects this year's property market outlook to be as good as last year. "For this year, we will try to maintain or achieve better than last year's RM1 billion revenue," group managing director Datuk Jamaludin Osman said in an interview with Business Times recently. I&P, a wholly-owned subsidiary of Permodalan Nasional Bhd (PNB), was formed about two years ago after the rationalisation exercise of three companies, namely Island & Peninsular Sdn Bhd, Petaling Garden Sdn Bhd and Pelangi Sdn Bhd. Jamaludin said the group is currently working on various phases of development in 12 townships, of which three are in Johor and nine in the Klang Valley. They include Bandar Baru Sri Petaling, TemasyaGlenmarie, Bandar Kinrara, Bayuemas, Alam Sari, Alam Impian, Alam Damai in Klang Valley; while Taman Industri Jaya, Taman Rinting and Taman Perling in Johor. He said the townships will take between 10 to 15 years to be developed, depending on its location and marketability. 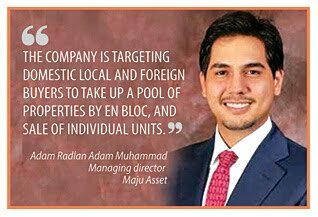 Jamaludin said people who buy the group's residential units are first-time buyers, upgraders and investors. Depending on locations, he said in some areas, there are more Bumiputera buyers, while in other areas the houses are equally sought by both Bumiputeras and non-Bumiputeras. The group has a total landbank of about 2,200ha in Klang Valley and Johor. "We are looking for good land for development," he said when asked if the group is expanding its landbank. KUALA LUMPUR: I&P Group Sdn Bhd, a wholly-owned subsidiary of Permodalan Nasional Bhd, displayed its various property projects at the Minggu Saham Amanah Malaysia (MSAM) in Ipoh recently. Projects include those in the Klang Valley and Johor. "We are the premier partner of MSAM 2011. Besides displaying our products, there were also various activities at our booth," I&P group managing director Datuk Jamaludin Osman said in an interview with Business Times. I&P was formed in May 2009 after the merger of three companies, namely Island & Peninsular Sdn Bhd, Petaling Garden Sdn Bhd and Pelangi Sdn Bhd. The group, which has a combined track record of over 130 years in property development, has built homes in more than 60 townships. Property developer, KSL Properties Sdn Bhd, is partnering Maxis to provide integrated end-to-end high-speed broadband Fibre-to-the-Home (FTTH) solutions for its residential development. Maxis senior vice-president (home services) Harold Quek said the partnership agreement would provide and commission telecommunications infrastructure for the provison of broadband services for KSL's residential development in Johor. "Immediate beneficiaries of Maxis' services will be the residents of 602 units of D'Esplanade Residence at KSL City," he told reporters after the signing ceremony here today. Upon completion of the D'Esplanade Residence next year, Quek said Maxis would be able to offer a full suite of exciting and interactive services for its residents. Maxis also planned to expand the offer to other KSL's development in Johor such as in Kempas Indah in Kempas and Bestari Heights in Nusajaya, both located within the vicinity of Johor Baharu City, he said. This strategic partnership, he said, provided an opportunity to Maxis to deepen relations with the customers in Johor Baharu. "We are already providing them with our wireless services and now we are paving the way to provide contemporary data products and suite of contents enriching the lives of our customers," said Quek. Maxis Home Services was launched in March and currently the service is available in selected locations in the Klang Valley. Within Johor, the services are available in Taman Molek. Meanwhile, KSL Properties chairman Ku Hwa Seng said the D'Esplanade, the KSL's most distinguished project, offered contemporary design and embraced technology to enhance residents' lifestyle. SELANGOR Dredging Bhd is buying a plot of land in Hulu Langat, Selangor from Webcon Sdn Bhd for RM31 million. The land is currently charged to Affin Bank as security for a banking facility granted to Webcon, Selangor Dredging Berhad said in a filing to Bursa Malaysia yesterday. Webcon has obtained a development order and building plan approval to develop the land into blocks of condominiums amounting to 540 units.